Announcement Hi there, thanks for visiting. 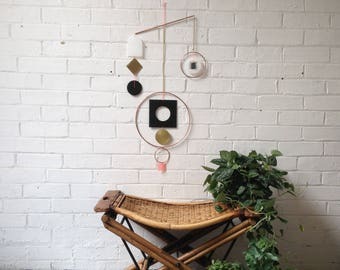 Here you will find a small selection of my work, most of my abstract mobiles are made on commission basis. I have a short waiting list so I have extended my shipping times to 4 -6 weeks to represent this. Instagram is the best place to see my most recent pieces of art. Thank you! Hi there, thanks for visiting. 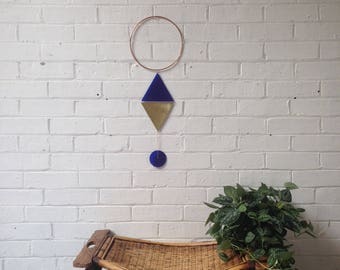 Here you will find a small selection of my work, most of my abstract mobiles are made on commission basis. I have a short waiting list so I have extended my shipping times to 4 -6 weeks to represent this. Instagram is the best place to see my most recent pieces of art. Thank you! New shiny wall hangings! Large statement pieces for a multitude of spaces. Geometric garlands and a pretty rad backdrop - made and styled by me for a festival. What's better then an Ice cream cart? A Shibori wrapped Ice cream cart! Bespoke fabrics by me for a birthday party. Dip dyed table cloth and lantern cluster. Hand made and styled by me for a photo shoot. Image by Philippa James. Hello, welcome to In The Making. My shop started as a result of the work I've done in the last few years as a stylist and maker for events such as weddings and parties. The props, textiles, installations and signage I make for these one off events have been developed into homewares. My work explores balance, movement and relationships between colour and shape. 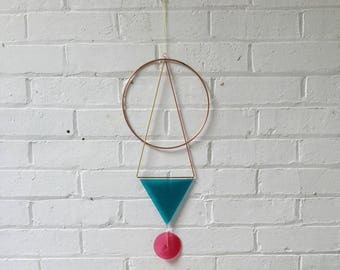 I really enjoy the mediative yet playful quality of the movement in the mobiles and hope they bring a sense of calm to the spaces within which they are hung. Providing a counter to the busy lives we have and a focal point to encourage reconnection, open mindedness and peace. 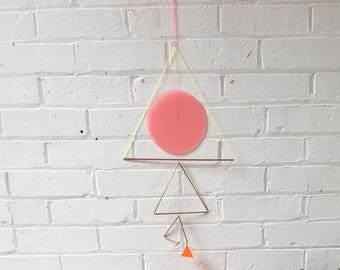 My commissions have been from smaller mobiles for babies up to large scale installations, most recently I've done a nation wide art installation for a fashion brand and regularly create all manner of decorations, props and artworks for events and venues. More projects and products coming soon! I am a maker and occasional event stylist/producer. 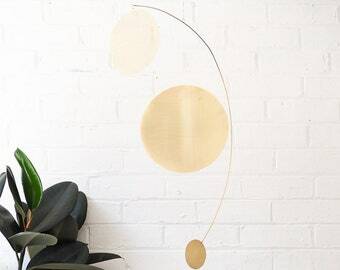 My growing homewares collection is inspired by the props and unique items I make for weddings and parties. I really hope you're happy with your item but if for some reason you are not, please get in touch. My wooden placemats/ coasters can take 4 weeks to make if I have wait list but you should get an idea of timeframes from the shipping time. Ordinarily I ask that you get in touch if you have a specific date you need your order by and I will do my best to work with you on this. All items are sent via 1st Class Signed For delivery in the UK - someone in to sign for for package. If you would like it sent via another means - 2nd class, Special (tracked) Delivery, please let me know. I use the Royal Mail courier service for the US which is also tracked. If you would like your package sent via any other service ( untracked and cheaper, for example) please let me know. If you are looking for an item to be sent to a country other than the UK or US please get in touch and I will find out a shipping cost for you.